Cakewalk has a custom controller/surface plug-in that allows a Roland A-PRO controller to control Cakewalk track, bus, and plug-in parameters (both effects and synths). This includes support for ACT (Active Controller Technology), which lets you use your controller to adjust plug-in parameters on whatever plug-in currently has focus. Figure 487. The A-PRO control surface plug-in enables full control of all Cakewalk tracks, buses, plug-ins and other parameters from your A-PRO MIDI keyboard controller. 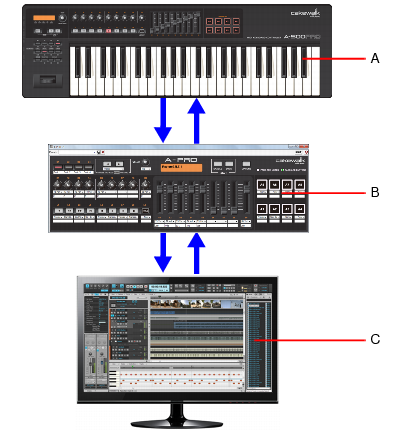 Enabling the Roland MIDI drivers in Cakewalk. Choosing the correct Roland In Port in Edit > Preferences > MIDI - Control Surfaces. Loading the correct memory preset in your Roland A-PRO. Please refer to the A-PRO owner’s manual for detailed instructions on how to configure and connect the A-PRO MIDI keyboard controller to your computer. Once you have made the necessary connections, you will need to configure your Cakewalk host program to recognize the A-PRO MIDI keyboard controller. Follow your A-PRO MIDI keyboard controller’s instructions for physically connecting the surface to your computer. Select A-PRO 2 in both the Inputs and Outputs lists. In the Controller/Surface field of the Controller/Surface Settings dialog box, select A-PRO. Assign both Input Port and Output Port to A-PRO 2. Note: Port 2 is the Controls Port, which is the port used by the A-PRO controls (rotaries, sliders, buttons and pads). In the Preferences dialog box (MIDI - Control Surfaces page), make sure that the WAI Display check boxes and the ACT Indicators check boxes are enabled, and click OK.
Make sure the ACT button on your A-PRO MIDI keyboard controller is pressed. When pressed, the ACT button launches the A-PRO control surface property page and allows your A-PRO MIDI keyboard controller to communicate with Cakewalk. Important: The ACT button should always be enabled when you want to control Cakewalk. When you open a project, the A-PRO MIDI keyboard controller responds and reflects the layout of the loaded project. Now that your Roland A-PRO is connected, you can see which tracks and/or buses are being controlled by it by looking at the colored markings (the WAI display; see The WAI display for more information) in Cakewalk’s interface. Open the A-PRO property page by double-clicking the WAI display or by choosing A-PRO from the Utilities menu. Once the Roland A-PRO property page is open, press F1 on your computer keyboard to open the Help file for the property page.